PST and Exchange data migration to Office 365. If your organization is planning to move to Office 365, the biggest challenge for a System Administrator is to make sure that Microsoft Outlook data with all the latest changes are gathered and moved to the cloud safely. It can get complicated to collect users' old PST files that are stored in many different locations. And, most of the time, these data files cannot be copied, as they are all locked when Microsoft Outlook is running. 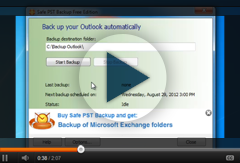 Safe PST Backup is designed to make it easier. Use our tool for automatic scanning and creating a backup copy of the PST files or Exchange folders and after, simply import your data into the cloud. It uses sophisticated technology to access Outlook items directly and backs up the latest changes automatically whether Outlook is running or not, without any interruption to end-user's work. Pruébelo Enterprise. No tarjeta de crédito. Migrate each user's data on your schedule. Each data migration project requires detailed planning and defined timeframes, as it is one-time process. Using Safe PST Backup you can always plan ahead and choose a wide range of scheduling options to have your data backups prepared on time. Schedule full backups to be created automatically either daily, weekly, monthly or every few days, weeks and months. You can also specify the day of the month and exact hour to start selected data backup process. Migrate OST and PST files with all the latest changes. Safe PST Backup tool uses fast incremental backup model and backs up Microsoft Outlook items that have been only recently changed or are new since the last backup. Users can also create data backup whether Microsoft Outlook is running or not and archive or migrate it to another workstation with all the latest changes. This helps to archive large data files more efficiently and allow to plan data migration to Office365 at any time, reducing the risk of data loss. Monitor users backup from any PC on your network. Safe PST Backup tool eliminates the need of managing the backup processes on multiple devices individually and allows System Administrator to monitor and manage backup process on all devices from one location. In case you need a fully automated custom Microsoft Outlook data migration solution, please contact us via Live Chat or email and we will develop the custom tool to meet your requirements and needs. Learn more, how to migrate data with Safe PST Backup here.